Though not strictly the last 109 variant produced, the Bf-109K-4 was the last of the line. All of the modifications and updates that could be crammed into the airframe were incorporated into the 109K-4. This included the latest DB.605D engine, wide wheels, tall tail wheel, tall fin/rudder, and something that was originally part of the 109 design but never added, fully enclosed wheels, both for the main and tail wheel. Despite all these additions and despite the fact that the plane was fast in a straight line, it handled like a pig. Only the most experienced pilots could wring out any sort of advantage with it and there were very few experienced pilots left flying this aircraft. Most of these men were off with the jets or later Focke-Wulf designs. The result was a somewhat dangerous aircraft for the new pilots; most of them not well trained. Fortunately for many of these men, the acute fuel shortage of the last 8-9 months of the war meant that most newly built planes either spent all their time on the ground, or had very few flight hours on them. As the war went away, so did the need for Messerschmitts and none of the 109K versions has survived. This is a continuation of the superb 1/72 Bf-109 series from Fine Molds. All these kits are based on at least one common sprue (sometimes two) which includes the wings and most of the general parts like wheels, interior, landing gear and the such. Each kit then gets any specific sprues needed to do the variant being kitted. If you read the G-10 article, you've seen all the bits that this one gets. In addition, there are 'K only' parts like the proper fuselage (radio access door is different), additional gear doors, and instrument panel (shown above). The general molding is quite good. I'd say a bit below Hasegawa, but not much. The wing sprue has some flas h thanks to being common to all their F/G 109 kits. The rest of the parts are well molded. Experience has shown that one needs to be a bit careful removing some of the smaller parts from the sprues. It is a good idea to test fit some of the bits. Those parts that attach to drilled out holes have some pretty large attachment points so you'll need to drill the holes larger than you normally do to get a good fit. But once in place, it looks great. It is also nice that Fine Molds makes an attempt and providing engine detail, but frankly, most of us will simply close the cowling sections. Instructions are quite well done with most of the instructions in Japanese. 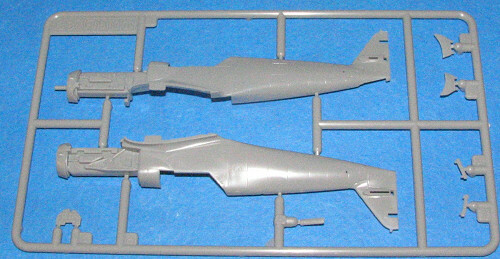 Tamiya and Gunze paint references are provided with RLM numbers given where appropriate. Construction drawings are quite well done and include any color information needed. Markings for two planes are provided. Both seem to be in RLM 75/83/76 with the high demarcation line and the prepainted fin/rudders in RLM 81/83. They are both from 10./JG 77 with the Reich Defense bands in white and green. These bands will have to be painted on by the builder. There are three decal sheets. Two are generic 109 and provide all the stencils and insignia (including the swastikas). The smaller sheet has specific decals and that includes an instrument panel decal. These instrument decals fit perfectly so use them! You know you want it. Though the Heller kit isn't bad (that is the later Heller 109K, the earlier one was a G-14! ), it is also over 30 years old and not as accurate. There is also another from Eastern Europe that I've seen advertised, but not in the flesh. This one has all the bells and whistles. I'm just very happy that 1/72 109 builders finally have a series of later aircraft that meets all the specs. My thanks to www.wingsntreads.com for the review kit. Get yours today at a discount.